We shall first review the developments in the School from the year 1959. As already stated earlier, the Free Progress System was introduced on an experimental basis in 1959 at the Secondary level; from there it evolved to a surer and larger base in 1961; a small group of students were trying out this method and the Mother named it Vers la Perfection. However the whole of the secondary section was not following the Free System. One section – in fact, the larger section – was still continuing with the old method. The school at the secondary level was thus divided into two sections. In 1963, as already mentioned in the previous issues, the whole secondary section was united and was brought under the purview of the Free Progress System. 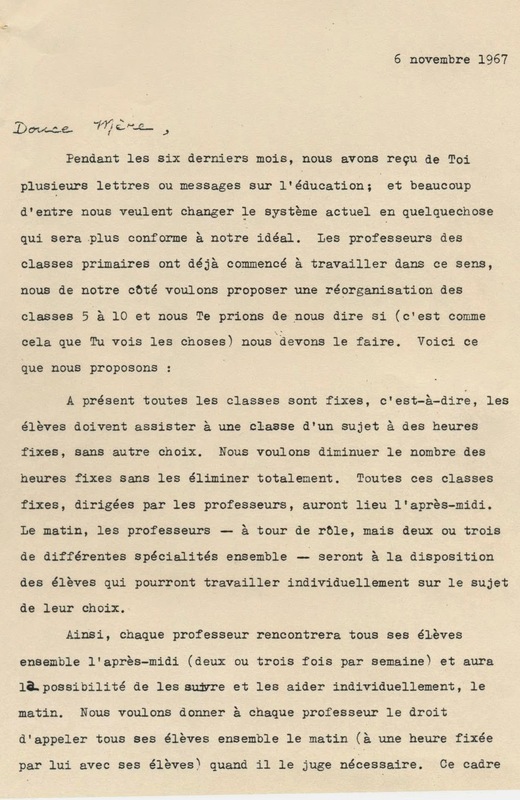 In August 1963, some teachers wrote a letter to the Mother regarding the Free System. This letter has been published in one of the previous issues. As a consequence of this letter the secondary section was again divided into two. One of them was following the Free progress method and was named Vers la Perfection and the other was following a modified form of the Free Progress System. This pattern continued from 1964 to 1967. It may be noted that the students of the Free Progress System did not have to sit for the quarterly Tests; for the other students it was compulsory. As already mentioned, in July 1967, many letters were written to the Mother regarding quarterly tests and, as a consequence, these tests were abolished. 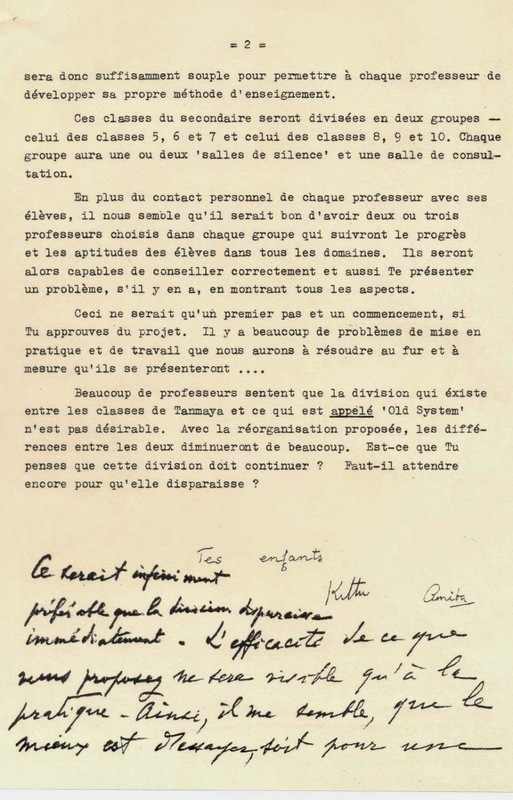 In November 1967, two teachers, Amita and myself, wrote a letter to Mother making some suggestions regarding the reorganisation of the secondary section. 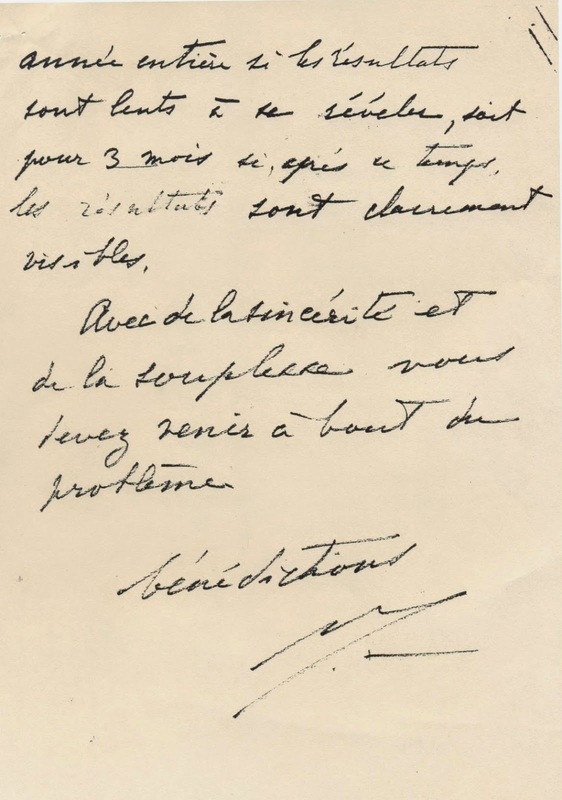 This letter is reproduced below. Many teachers feel that the division between X’s classes and what is called the “Old System” is not desirable. With the reorganisation we suggest, the differences between the two will be greatly diminished. Do you think that this division should continue? Must we go on waiting for it to disappear? It would be infinitely preferable that the division should disappear immediately. The effectiveness of what you suggest will become apparent only in practice. Therefore it seems to me that the best thing is to try, either for a full year if the results are slow to show themselves, or for three months if the results are clearly apparent by then. With sincerity and flexibility you should be able to solve the problem. On the 11th November, Mother gave an interview to three teachers, namely, Tanmaya, Arati and Kittu. In this interview the details of the new proposals were discussed. The Mother also gave the name En Avant to the new section. However in 1968, the two sections did not unite. It happened only in 1969. Thus there were two sections at the Secondary level, one named Vers la Perfection and the other named En Avant. Both these sections were following the Free Progress system with minor differences. In 1969, the two sections got united, and it was given the name of En Avant Vers la Perfection or EAVP. The ideal would be, in a few years, to have a rejuvenated Sanskrit as the representative language of India, that is, a Sanskrit spoken in such a way that—Sanskrit is behind all the languages of India and it should be that. This was Sri Aurobindo’s idea, when we spoke about it. Because now English is the language of the whole country, but that is abnormal. It is very helpful for relations with the rest of the world, but just as each country has its own language, there should... And so here, as soon as one begins to want a national language, everyone starts quarrelling. Each one wants it to be his own, and that is foolish. But no one could object to Sanskrit. It is a more ancient language than the others and it contains the sounds, the root-sounds of many words. This is something I studied with Sri Aurobindo and it is obviously very interesting. Some of these roots can even be found in all the languages of the world—sounds, root-sounds which are found in all those languages. Well, this, this thing, this is what ought to be learnt and this is what the national language should be. Every child born in India should know it, just as every child born in France has to know French. He does not speak properly, he does not know it thoroughly, but he has to know French a little; and in all the countries of the world it is the same thing. He has to know the national language. And then, when he learns, he learns as many languages as he likes. At the moment, we are still embroiled in quarrels, and this is a very bad atmosphere in which to build anything. But I hope that a day will come when it will be possible. So I would like to have a simple Sanskrit taught here, as simple as possible, but not “simplified”—simple by going back to its origin... all these sounds, the sounds that are the roots of the words which were formed afterwards.